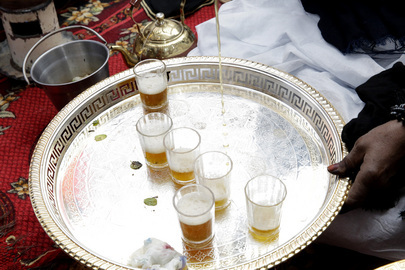 A close-up of tea being poured as part of a traditional ceremony observed by the Sahrawi people. Secretary-General Ban Ki-moon visited with this Sahrawi family today on his way back to the Bir Lahlou site of the United Nations Mission for the Referendum in Western Sahara (MINURSO) after taking part in a demining demonstration nearby. Mr. Ban is visiting the region in hopes of raising awareness of the dire humanitarian situation Sahrawi refugees are facing and to encourage parties to the Western Sahara conflict to find a lasting and mutually acceptable resolution to the now forty-year-long discord.